According to Marketingland.com, links are the currency of the web. However, mass links exchange with no target has turned out to be not successful and harmful to your domain’s rankings. Blogger outreach campaigns have become more popular and have proved their effectiveness. Still, not everyone knows where to search and how to contact blogger who might be interested in your content. How to Find Influencers according to Advanced Blogger Outreach Strategy? People who post similar content to yours are potential influencers, who would love to acquire some new ideas and offer guest blogging opportunities. Popular posts usually are actively discussed by other bloggers and you may find them in comment section. LinkedIn nowadays provides the perfect way of connecting with influential users and starting a conversation to build a relationship with. Follow their posts, read what they publish and upvote their comments, reply to their tweets and leave meaningful comments on their blog. Explore how to comment on blogs and approach bloggers steadily. You never know what will work for a blogger. Experiment with different subject to understand what works better for your niche/product. Investigate what has been already published in order not to offer old or boring ideas. Have a think about what may attract an audience and bring more visitors to a blog. Do not send too many follow ups or reminders, as it is bothering. Mobilunity team understands that developing an effective outreach strategy takes much time and efforts. Our SEO Team experiments by reaching bloggers in different ways. Afterwards, we conduct a deep analysis on what was the most effective way of approaching bloggers. “Building up a social presence for your domain is a complicated and time-consuming thing as not all bloggers are ready to interact. 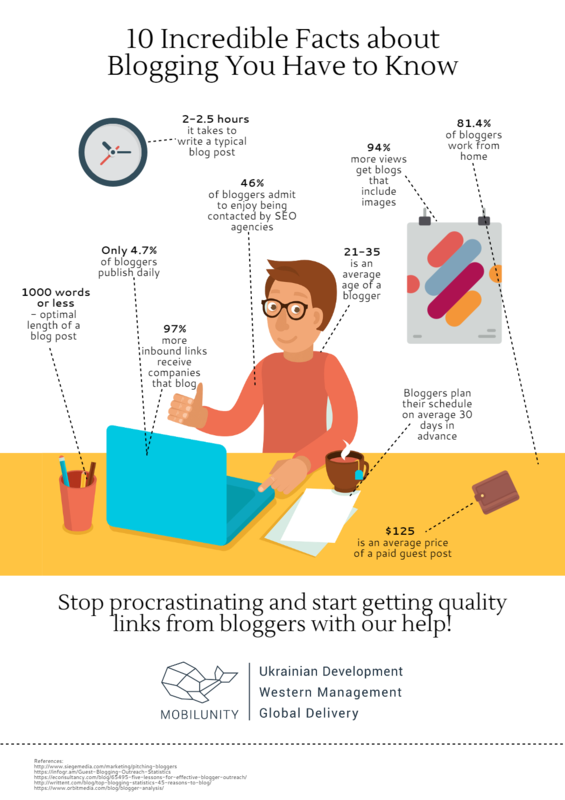 So if you want to acquire quality links, you’d better arm yourself with patience and insistence” – Anna, Outreach Expert. In case you need assistance with searching or contacting a blogger for contribution, do not hesitate to ask us for help! We will help you to build a strong relationship with bloggers in any niche!